I had been thinking of taking this cruise since its inception five years ago, and was inspired to finally sign up after receiving encouragement from a fellow Bryn Mawr Film Institute member who sailed on the prior four trips. If you are thinking of going on a future TCM cruise, you should pre-enroll early. The ship fills up quickly. My wife and I checked the TCM web site regularly for the sign-up period and pre-registered in early spring for the November 1 cruise. If you don’t make it on the first round, they put you on a wait list, just like you are applying to a college. We sailed out of Miami and stopped at Grand Cayman Island and Castaway Key. 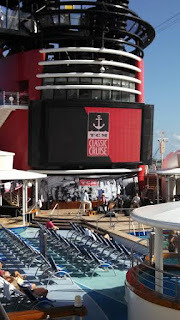 We were on the Disney Magic, but there were only 17 children onboard. Not your typical Mickey Mouse experience. On the first afternoon the guests were introduced by TCM hosts Robert Osborne and Ben Mankiewicz. These included Eva Marie Saint, Lou Gossett, Jr., Angie Dickinson, Roger Corman, Ruta Lee, Illeana Douglas, and Alex Trebek. Robert Osborne started out as an actor quite a while back. He became a friend of Lucille Ball, who gave him some career altering advice. She said he could continue as an actor, but he was a journalist major, loved film history, and was a good writer. She said he should write about the movies. He took her advice, and, he said, he found his true calling. Osborne interviewed Angie Dickinson, and commented that her talents were wasted often. She said that she loved working with John Wayne on Rio Bravo, and felt that his performance in that film showed a range of emotions. She said he wasn’t given enough credit for his acting abilities. Eva Marie Saint discussed the differences in the directing styles of Elia Kazan and Alfred Hitchcock. In On the Waterfront, Kazan wanted the actress to work from the inside out in the Method Acting style, tapping into a feeling of innocence being lost, since her character was brought up by nuns, and then was exposed to the brutality on the docks and the sexual feelings toward Marlon Brando’s character. Obviously it worked, since she won the Oscar for Best Supporting Actress. On the other hand, in North by Northwest, Hitchcock took her shopping, molding her character from the outside in by fashioning the character’s seductive and deceptive personality through the clothes and make-up she wore. Ms. Saint had praise for those with whom she worked in films except for one person – Gary Marshall, Penny’s brother, who directed her in the early Tom Hanks’ movie, Nothing in Common. She said he cut out scenes which provided insight into her character, and did so without informing her. Los Gossett, Jr., described how Richard Gere came onto the set of An Officer and a Gentleman with a bit of a Hollywood star attitude. But, after he realized that Gossett and the rest of the cast and crew were there to work hard to make the film the best it could be, Gere came around and pulled out all of the stops, especially in the scene where his character cries out that he can’t quit because he’s “got nowhere else to go.” He added that the two of them trained for months to learn martial arts to prepare for their roles. I had a chance to get Mr. Gossett’s autograph, and I mentioned that I recently saw Skin Game again, the film in which he co-starred with James Garner. This movie is, of all things, a comedy revolving around slavery in the South. Garner’s character sells Gossett’s African American as a slave. Gossett’s character latter escapes, and they split the profits. There is a serious undertone to the film, given the subject matter. Gossett commented to me that the film was ahead of its time. I felt that it could have influenced Quentin Tarantino when he made Django Unchained. The song “My Way” could have been written for producer/director Roger Corman. He recounted his maverick ways in Hollywood, never bending to the will of the studios. He described how he made films in a week, rehearsing for three days and then shooting for two. Sets were reused to cut down costs. I remember seeing and enjoying those Vincent Price starring movies based on Edgar Allan Poe’s stories. Corman gave many movie greats their starts, including Francis Ford Coppola and Ron Howard. In a film clip, a tearful Jack Nicholson expressed his love for the man that ushered him into the movies. Speaking of Mankiewicz, I asked him what film he feels compelled to watch whenever it is on TV. He said there were several, but he singled out another Kazan movie, A Face in the Crowd, an early fascinating study of the way the power of the media can be used to sway the masses, as one of his favorites. Recent films such as Gone Girl, Nightcrawler, and even The Hunger Games franchise have dealt with this theme. Alex Trebek interviewed actress Ruta Lee who appeared in Witness for the Prosecution, and many TV shows. She and Trebek worked on a game show in the past. She dressed glamorously and was very funny and engaging. Trebek conducted two movie trivia sessions, and he is quite knowledgeable about films. These events fill up fast. The first required participants to recognize movie quotes. The second demanded a knowledge of film music scores. There are usually six people per team. The group with whom I sat finished second in the music competition. If you sail on this cruise, beware of the six retired schoolteachers, also known as “The Dirty Half-Dozen.” Rumor has it that they network every week all year preparing for the competitions. They have won every trivia competition in which they participated on all the TCM cruises, sometimes getting every answer correct! Be afraid, be very afraid. Of course, there were movies being screened all day long. You can watch them in theaters, in your stateroom, and on a huge screen in the pool area, enjoying the stories in tropical warmth under the stars, both celestial and celluloid. Next week’s discussion is on a recent movie, Roman Polanski’s Venus in Fur.